Extraction of groundwater is restricted in parts of the Botany Bay area by order under the Water Management Act 2000 due to a century of industrial pollution. A revised temporary water restrictions order was issued in 2018. Groundwater extraction for non-domestic uses and by water access licences holders specified in the order must comply with revised requirements. 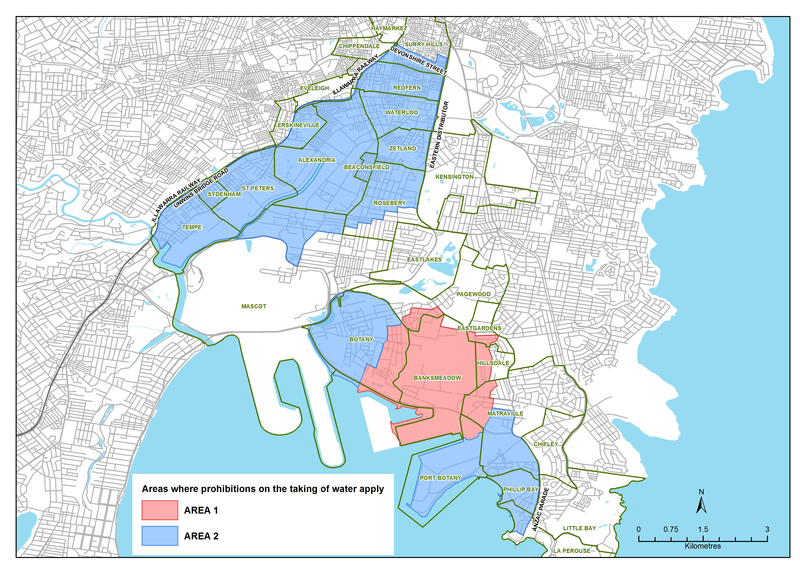 Temporary water restrictions for groundwater extraction have been in place since 2006 for parts of the Botany Bay area (see map below). The restrictions seek to minimise the risk to residents from exposure to potentially polluted groundwater. They also prevent the movement of polluted water through widespread pumping. All domestic use of groundwater in this area is banned. Taking water for non-domestic uses is permitted under certain conditions and requirements. A revised temporary water restrictions order was issued in 2018 to clarify the conditions for taking water for non-domestic purposes in Area 1 and 2.
records of testing are kept in accordance with the requirements specified in the Order. certified in writing by a appropriate consultant as being safe and suitable for its intended use. Holders of industrial groundwater extraction licences listed in the water restrictions order and those using water for non-domestic purposes in Area 1 and 2 on the map must comply with conditions and requirements. Extraction by residents for domestic purposes is prohibited in Area 1 and Area 2. For more information about the fit-for-purpose test and the extraction of water in the restricted areas, see the current Temporary Water Restrictions Order for the Botany Sands Groundwater Source 2018 ((PDF 274.0 KB)) or contact your licensor. NSW Department of Industry—Lands & Water is the licensor for state significant development and infrastructure proponents, government agencies and water utilities. WaterNSW is the licensor for other customers, including local residents. Report any suspected pollution incidents or water quality issues to the Environment Protection Agency’s environment line on 131 555.